Home JUOrtho Blog Invisalign – Are clear braces right for you? While traditional braces have their uses, many prefer the cosmetic appeal of Invisalign. Aligners are particularly popular with adults who may wish to avoid the social stigma of traditional braces, but they can also be used to correct minor issues with a person’s teeth alignment in a relatively short period of time. While the cost of these aligners is often higher than traditional braces, Invisalign offers several benefits over conventional appliances. Invisalign is an orthodontic device aimed at correcting malocclusions. These appliances are clear trays that fit over a patient’s teeth and may be removed at any time. As the patient progresses through a course of treatment, new trays are made to guide the teeth into their final position. Because these aligners are removable, it is imperative that the patient observes the proper course of treatment as failure to do so can cause the teeth to move in a way that necessitates new trays, and this will undoubtedly increase the treatment time. Because these aligners are clear and are designed to fit directly over the teeth, the cosmetic effect of the device is its strongest selling feature. At first glance, it’s nearly impossible to detect Invisalign, and the appliance may even stand up to closer scrutiny. Traditional braces are immediately apparent, and even ceramic braces may create an unwelcome patterning across the teeth if the ceramic is a different shade of white than the teeth. Invisalign is most popular with adults for this reason, but many teenagers also appreciate these aligners to avoid the social stigma of braces at a time where fitting in and establishing an identity may be a top priority. Invisalign requires no installation and no maintenance once the appropriate tray is cast. Because there is no equipment to attach, aligners are typically more comfortable than traditional braces. While both types of appliances may have some initial soreness, traditional braces must be tightened and adjusted on a regular basis, which can cause periods of tenderness each visit. Invisalign may create some soreness initially, but the teeth generally lose their sensitivity sooner than with traditional braces. Invisalign also makes oral hygiene much simpler. 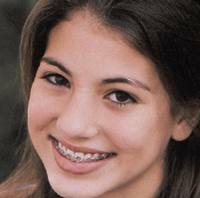 With traditional braces, flossing will often necessitate the use of threaders, which can discourage many from the task. Furthermore, the fact that braces adhere to the teeth can lead to decalcification and decay, which can create problems once the braces are removed. Food particles may also get trapped with traditional braces while aligners can be removed, allowing the patient to clean all surfaces of the teeth. With traditional braces, there will also be foods to avoid to help prevent damage to the braces or to the teeth. With Invisalign, the patient will have no food restrictions. For those with mild alignment issues, Invisalign can correct these issues in a more expedient time frame than traditional braces. Trays are typically replaced every two weeks, and a course of treatment can range from four months to a year. Some patients may also opt to whiten their smile while straightening it, and aligners may serve as whitening trays as well. Once all treatment is completed, the final tray can be used as a retainer. Regardless of the type of treatment you pursue, JU School of Orthodontics stands ready to assist. With costs much lower than the competition, you can find a treatment plan that matches your lifestyle as well as your budget. Why hide your smile away from the rest of the world? At JU School of Orthodontics, we make every smile shine.